I always had the idea of doing a Kickstarter campaign for bakslap because to me it would give validation to the product, allow us to build an early online community that knew the reason behind the brand and would become early advocates for us. I’m happy to share some of our experiences and hopefully you too decide to undertake a Kickstarter. Ultimately, we were preparing our Kickstarter from February 8, 2018 until launch day June 26. I’d personally started reading on it and creating documents and checklists of what should be in place and what others said ‘they wish they had done’ back in November 2017. I was always giving it thought from that point on. Team: We were fortunate to have six interns from the University of the Sunshine Coast to help us in the five months leading up to our Kickstarter. They were most valuable because they helped in designing material for the launch event, input on social media strategy, social media content creation and photography. They also brought energy which was essential, as it was long days and nights in the months leading up to our campaign. Launch Event: We organised a local Kickstarter launch event to generate early PR in the campaign that we would then leverage when hitting the towns on our road trip. We also wanted an event to invite local businesses and supporters too, to demonstrate how advanced we were in our business/product process; see our branding and hear the story behind what we’re creating, from myself and guest speakers. We selected the Alexandra Headland Surf Club as it was in line with our brand and allowed us to begin a relationship with the club and its members. 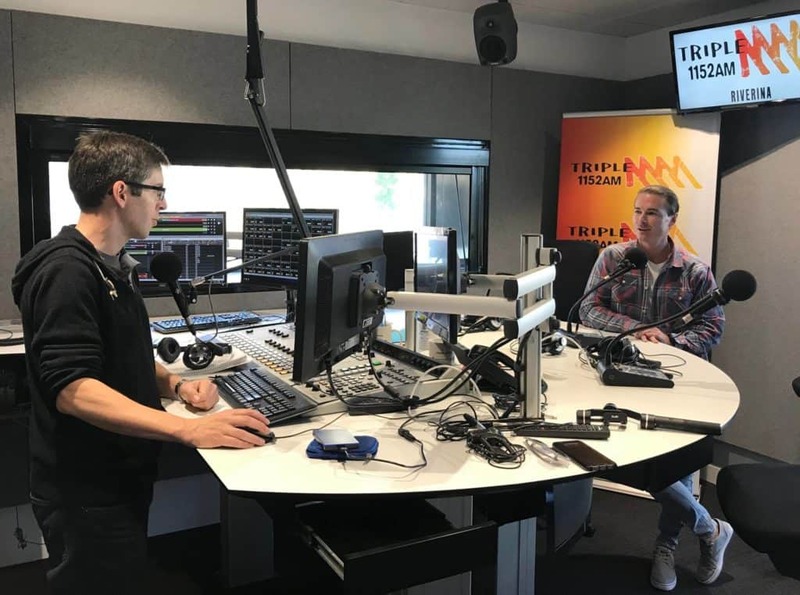 Public Relations: Time was spent with a PR expert, Julie Coulthard from Inkee PR, writing several variations of a media release to be used during our campaign for radio, television, and print. We made sure there were some long form and some short form releases and various images to accompany them. Ad Strategy: To combine pre-created content with campaign generated PR content to target selected locations we would visit. Kickstarter Page: This took a colleague Jeremi Dickson and I a total of eight weeks to complete. There was a lot of thought that went into colours layout, the copy and combining several images into one separate JPEG so it could be more evenly spaced (resulted in a much cleaner layout). The page layout was tested for two weeks and based on feedback we adjusted it accordingly. A lot of time was spent writing the content but it was most valuable, as now we have pulled from this page repeatedly to use on our website and for packaging. Launch Event: It achieved exactly what we aimed for, by key local businesses attending and guests hearing the story behind ‘why’ we are doing what we are and the impact we want to make. We live streamed it on Facebook and we were able to generate radio, newspaper and two TV networks covering it. For the four days post launch event especially, we were inundated with media requests, cutting footage on a quick turnaround and began running our Facebook Business Manager campaigns in the specific locations that we were going to begin building awareness. There was also a lot of sharing and activity on social media that needed to be replied to – as one of our goals was we wanted to engage and build an online community. International: We wanted to use the campaign to test internationally. The US was one market where we found we were a little vague in our campaign and audience creation via Business Manager in the first couple of weeks. In the last 2 weeks however, we addressed this by specifying locations as well as two interests such as sunscreen, vacations, sun tanning, and Kickstarter which generated better results and more conversions. We also ran ads in locations where we have early stockists which were Bali, Hawaii, Granada. On the Fly: One three-day push for awareness was in J-Bay, South Africa where the WSL pro surfing event was being held. We targeted a 15km radius to generate some interest with athletes during their downtime. Pro surfing is a target market, so this was an opportunity for some early stage awareness building. Spain and surrounding Spanish speaking countries were also targeted during the campaign as these are future markets of interest due to high levels of sunshine and tourism. Although our Facebook ads didn’t perform very well. It had the lowest average of video watched 8-10%. We translated two video versions into Spanish subtitles to try and target a new audience. The content did not translate as a native ad would have – possibly the English voice over as well could have deterred people from watching further. Bali was another test market and has the second lowest video watched 11%. Again, language barrier could have been an issue, although we targeted native English speakers. Surprisingly the lowest click through rate at 22c per click which would be because of the minimal competition and population size. Facebook: It was selected as our primary platform because it allowed for more conversation, sharing, real-time content and clickable links. Two thirds of our pledges came through our custom link that was heavily referenced and shared on Facebook (www.bakslap.com/kickstarter). Radio: If given the option to do live radio in the studio or to call in and have it pre-recorded, I would always insist for live in the studio. This is because it creates more engaging content, but most importantly so I can look at and have a ‘real conversation’ with the host. I strive to build relationships, and by being in the studio you can build one with the host and their producer – all of which said to get in contact when bakslap is available and on the shelves. Thank you: We found we couldn’t say thank you enough – thank you to the hundreds of backers who saw value in our project and were the reason it was funded and continues the journey towards getting to market. Our team met for dinner and celebrated as everyone played a part in preparing and executing our plan. For me personally, I was exhausted with all that was involved with the many months of lead up and from 23 out of the 30 days traveling. That was a lot of content on our website/socials that had been branded with Kickstarter so it was matter of going through and removing some of these. However, we have kept the ‘K’ icon at the top of our website as a permanent link to the Kickstarter page as this acted as social proof as well as a timeline of where we were at. Our Kickstarter campaign exceeded our goal and we raised $48,377 in 30 days and this was to cover the majority of the manufacturing costs. We were also rewarded with being able to build a community, getting the brand name out there, building valuable social & media contacts in Australia and internationally for when the product launches before Christmas this year. We ran a total of 37 campaign ads through Business Manager. You certainly need content to do this and someone with experience to help set your audiences and analyse the results every couple of days. I had Jeremi Dickson from Leeroy’s Media Co. We had a budget and stuck to it. Our total spend was $1034. This we felt was a good result vs spend. The reach from the ad spend was beyond what could have been achieved organically. Reaching key locations internationally (e.g. US, Brazil, Spain and Bali) allowed us to most efficiently target key audiences while continually refining our campaign based on key discoveries through our data analysis. 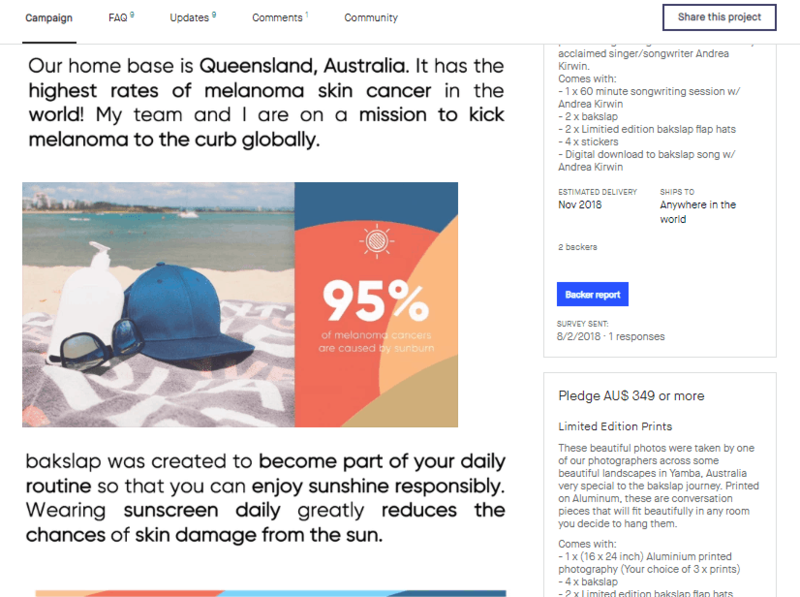 As a tool for brand recall and lift matched with the organic activity – we were able to drive a hyper-local digital campaign (e.g Sunshine Coast, Wagga Wagga, Goulburn, Gold Coast) as well as test international audiences. It was definitely a tricky campaign, as it was a crowd-funding campaign not an e-commerce campaign. It would be interesting to see what results will come from directly being able to purchase the product when available. The path to purchase would be very different from a purchase product now approach to a crowdfunding purchase approach. There is no doubt that a key factor in E-commerce sales is immediacy of the delivery of product – people want what they purchase, now.